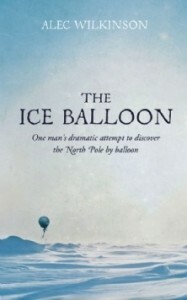 The Ice Balloon is the story of Sweden’s S.A. Andrée’s attempts to reach the North Pole by balloon in the 1890s. Interspersed with his story are accounts, some several chapters long, of other nineteenth-century Arctic expeditions. There are also chapters on ballooning, ancient myths about the region and the numerous different terms for ice. Indeed Andrée’s story is only the backbone of a book which is as much about Arctic exploration in general as it is about the exploits of a single man. The fate of Andrée’s second and final attempt to reach the North Pole is revealed early as the book opens with the discovery of Andrée’s remains and those of his two companions in 1930, thirty-three years after they took off. Their balloon came down on an ice floe, having travelled 517 miles in 65 and a half hours, at the time the longest ever balloon flight. But they were still 300 miles from the North Pole. Andrée and his two companions gave up their attempt to reach it and set out to trek overland to a food depot. Travelling across the Arctic is fraught with difficulties, in addition to combating the biting cold. Unlike the Antarctic there is little land, only ice. In summer the ice moves and breaks up, throwing the unsuspecting traveller into the icy waters. Marauding polar bears are a real danger. Hauling heavily loaded sledges through slushy ice and over the rough Arctic terrain makes, in the words of one Arctic explorer, all other physical work ‘child’s play in comparison’. The three men died three or four months later having reached White Island where they were preparing to winter. The actual cause of their deaths has never been satisfactorily established. Various suggestions have been made; food poisoning, scurvy, trichinosis, carbon monoxide poisoning, dehydration, murder, suicide, polar bear attack or simply fatigue. However the state of the men’s corpses and their subsequent cremation has made any certainty impossible. Andrée had been treated as a national hero. His expeditions had been sponsored by the King of Sweden and Albert Nobel. He was described as a hero ‘with the old Viking blood in his veins’. On his departure from Stockholm, he was cheered with shouts of ‘Long Live Andrée’. Accounts of his attempt to reach the North Pole were published in papers across the world. The ashes of the three men were buried in Stockholm in 1930 in the presence of the King of Sweden. Although Alec Wilkinson shows that Andrée’ s preparation were inadequate he rejects modern claims that Andrée was a sensationalist who wanted to be famous for the sake of being famous and was prepared to lead his much younger companions to their death if that was the price to be paid. Instead he regards Andrée as an engineer and scientist, overcome with the romance of the North Pole, who realised that if he didn’t risk setting out when he did, the opportunity might be lost forever. Alec Wilkinson’s starting point for his book was a photograph that his wife showed him. Intrigued by the caption, ‘Andrée’s balloon on the ice’, Wilkinson, a staff writer for The New Yorker and the author of nine other books, researched the subject and wrote his book. The Ice Balloon is an extremely readable account of nineteenth-century Arctic exploration with Andrée’s balloon journey at its centre. It is a shame that the maps reproduced in the book are too small to do justice to the epic journeys they depict.